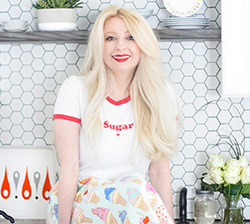 I can't tell you how long I've had Lofthouse style sugar cookies on my 'must bake' list. Too long, really. Whenever I see them in grocery stores I can't help but smile. They are always decorated with sprinkles (yes!) and they are often seasonally themed; heart sprinkles for Valentine's Day, red, white and blue sprinkles for July 4th and - you guessed it! 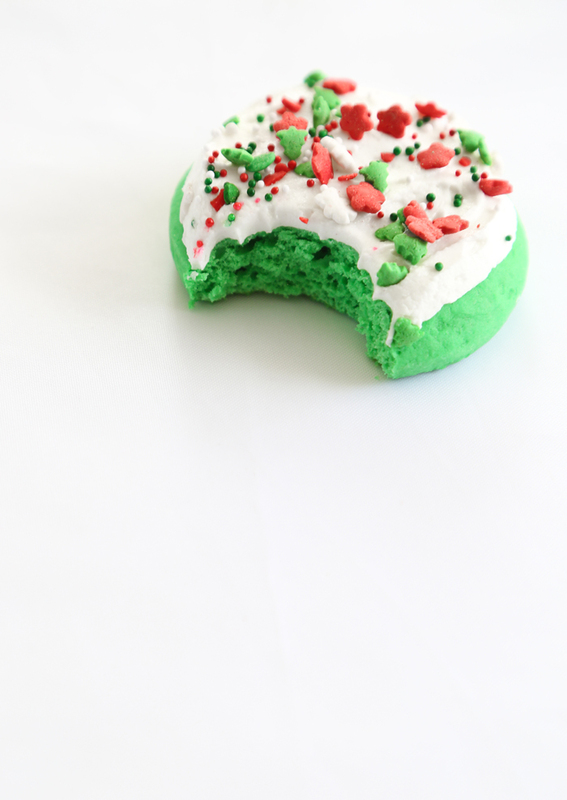 My favorite version is Christmas themed with red and green sprinkles. A word about the cookie dough - it's sticky! 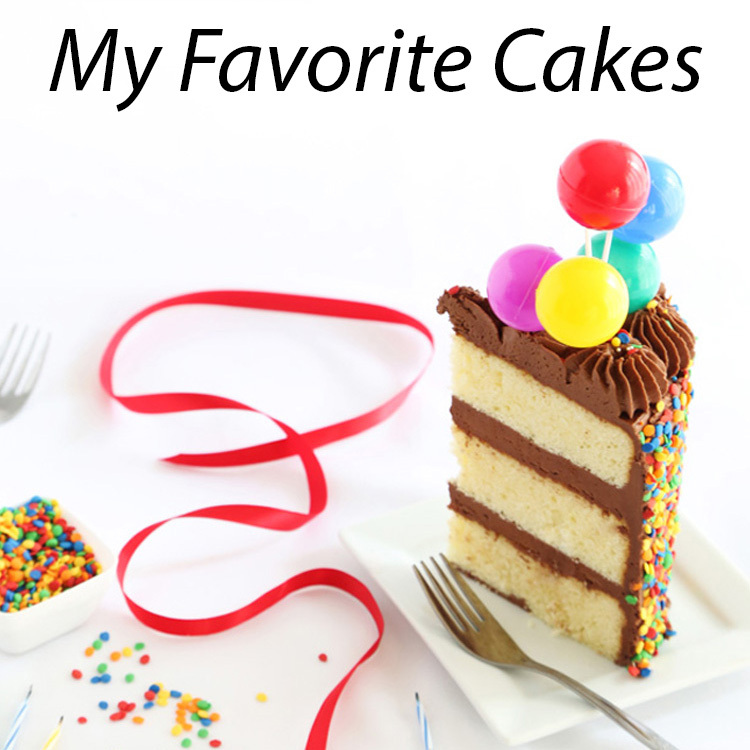 I was surprised that all the recipes I studied before making these barely mentioned this fact. I suggest chilling the dough in the refrigerator until it's firm enough to handle. Be sure to read my note at the end of the recipe, too. There are a couple of different dough-shaping techniques. These turned out really cute. They're so colorful, I'd almost like to hang them on the tree! Make the cookies: Cream the sugar and butter together until smooth. Add the eggs, sour cream and vanilla. In a separate bowl, sift together the flour, baking powder, baking soda and salt. Add the dry ingredients to the wet ingredients and mix well. Dough will be soft and sticky. Divide the dough in half. Return half the dough to the mixing bowl and add red food color; mix well. Turn the red dough out onto a piece of waxed paper and wrap. Wash the mixing bowl and return the remaining dough to the bowl. Add green food color and mix well. 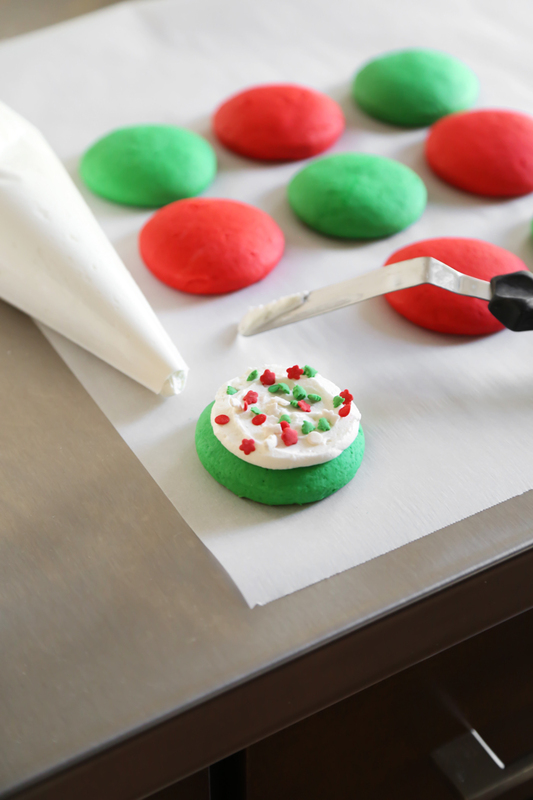 Transfer the dough to a piece of waxed paper and wrap. Refrigerate both portions of dough until semi-firm, at least 1 hour. Remove cookie dough from refrigerator. Use a tablespoon to scoop the dough into portions, and roll between your palms. Lightly dust your hands and the dough with flour if sticky. Place dough balls on the cookie sheets 2inches apart. Gently flatten the dough balls with your palms. 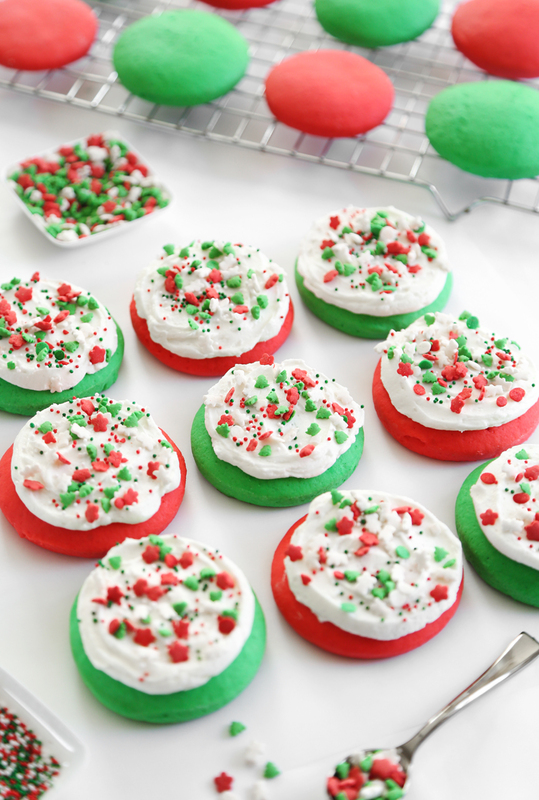 If there are streaks of flour on the cookies, gently dust it off with a soft pastry brush. 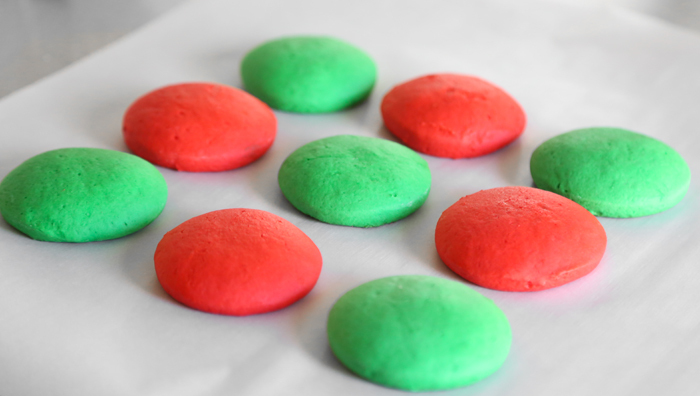 Bake the cookies for 10-12 minutes, or until they are puffed and fragrant. Transfer the cookies to a wire rack to cool completely. Make the frosting: Cream the butter with an electric mixer; beat in the powdered sugar 1/2 cup at a time. Beat in the vanilla. If the frosting is stiff, beat in the milk or cream 1 tablespoon at a time until a smooth, fluffy consistency is achieved. 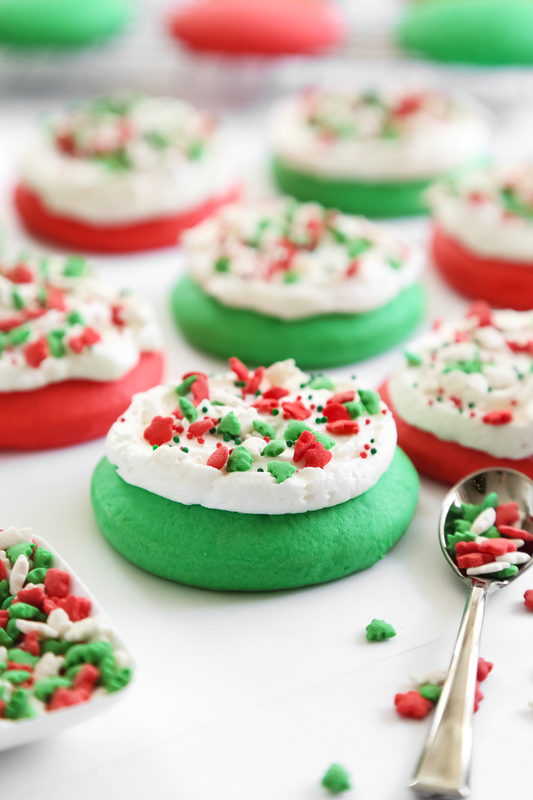 Use an offset spatula to spread the frosting onto the cookies (I used a disposable piping bag with the tip snipped to get an evenly round layer of icing, then used and offset spatula to smooth it out). 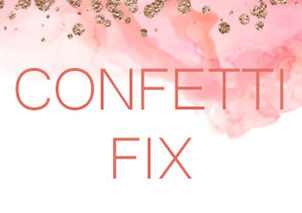 Cover the icing with confetti sprinkles soon after icing. Notes on the STICKY dough: I tested two techniques for making these cookies. The first was rolling the dough into balls and flattening them (as indicated in the recipe) which worked pretty well but was very sticky and I had to dust my hand with flour constantly. The second time I dusted a work surface with flour, dusted a rolling pin, dusted the dough, and rolled the dough to a little less than 1/2-inch thick. Then I cut the dough into 2-inch circles. Both yielded good results, but the ball-rolling seemed to go a little quicker. Oooooooh. Squeal! Can't wait to try these out! ... Er... I mean...um...make these for the neighbors. Oh wow, these are so vibrant and festive. Thank you. The colors are so vibrant they are just calling 'make me make me' . I'm definitely going to try these. I just have a question though, how well do they keep? Heather as usual these are beautiful, everything you do is exceptional!!! Can I freeze this dough do you think??? Hi Sharon! I think this dough would freeze beautifully. This handling of this dough greatly improves with refrigeration, so I think freezing would help when it comes to shaping the dough. I haven't tried it, but I say - go for it! I love these. My daughter and I plan to make these for Xmas. If anyone needs a "stackable" buttercream, Karen's Cookies has a recipe that dries but is not hard where you can stack the cookies for platters or boxes. How soft do you like your cookies? Hi Lieska, sure thing! Full fat yogurt can be used in its place as long as it's not terribly runny. It should be thick. You can strain plain yogurt in a cheesecloth overnight and use it in this recipe. I hope this helps! I made them today and they are very delicious but the colours faded a lot in the oven. Didn't use the colors are its not Christmas, haha but they were awesome!! I used a little less powdered sugar, but it was just what I wanted! Subscribe to our newsletter. Receive email updates when we post new content. 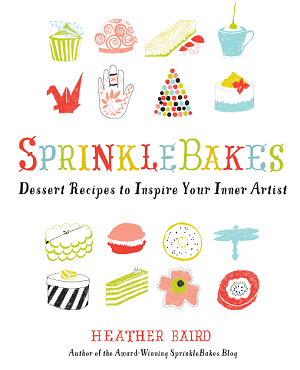 The Sprinkle Bakes Book, On Sale Now! 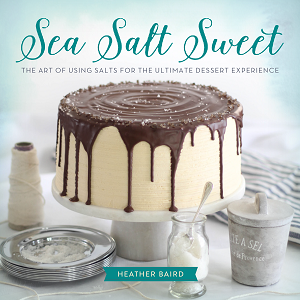 Copyright © 2008-2019  Heather Baird All Rights Reserved.